I finished spinning the camel down and can't wait to get some more. It's plied with copper thread so it shimmers and sparkles and it made me sad that all of it had to go to the knitters for the quiddich team. I guess I'll have to make more! Since I'm not able to knit right now I dug through the fiber stash and spun up this great stuff - purple, orchid, and brown wool. There isn't much, but I'm thinking it will be great as trim for a purple and brown striped sweater. I don't usually like brown but I really like it paired with purple - but of course everything looks better with purple! 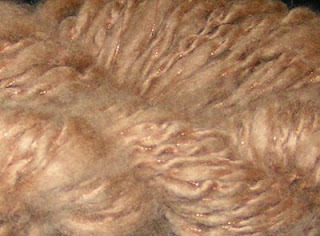 Right now I'm working on a braid of roving from squoosh on etsy. 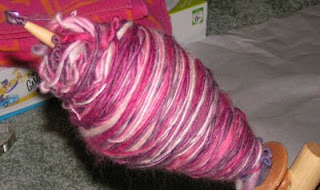 The colorway is Berry Tart, and it's full of berry goodness - lots of pinks and plums. I want to ply this with some thread, too, but use several colors instead of just one. I want some sparkle on this one, too. 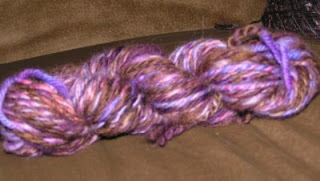 I spun it all on Jenny's kick spindle which I really enjoyed. With all of the practice I've had lately, I'm starting to get pretty good at spinning. I really like it - it's very calming and engaging yet mindless at the same time. Check out the score I got at Goodwill last week! Six dollars a pair for these great boots. 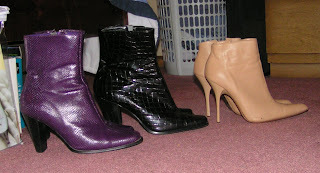 Unfortunately, my feet are getting as achy and painful as my hands, so I won't be wearing them for awhile. They'll look great when I can wear them, though. The other day I got in the mood to look at knit skirt patterns. In my quest I discovered so many great patterns in my stack of magazines - loads of great sweaters that I had forgotten about. I'll be marking all of the ones that I have stash for so I can (hopefully) get working on them soon. I've told myself to start using all of my magazines and books instead of letting them gather dust. We'll see how long that lasts. Ideas - My Head Could Burst!